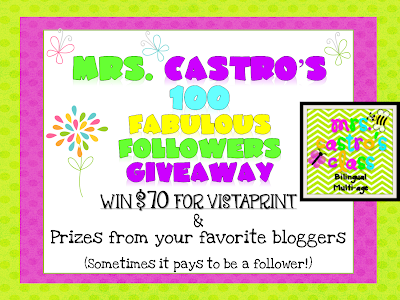 Mrs. Castro's Class: 100 Followers Giveaway…It’s HUGE! I’m celebrating 100 followers! I’m so glad I discovered blogs last summer! My classroom has been lovelier and my instruction more inspired every since! I hope my little blog can do the same for some of you. With this giveaway, I’m celebrating my followers. Some of you have been there since nearly the beginning, thank you! Others have joined over time, thank you! Those of you who take the time to leave comments and email, THANK YOU! I love getting comments and emails! This giveaway is a great chance for you to win products and fun stuff from super established bloggers and some newer bloggers who can’t wait to show you what they can do! Instead of having about 50 little winners, I am choosing to have 6 BIG winners through 6 different giveaways that you’ll find below. I’ve tried to keep the giveaways fairly equal in value, but make sure you go through all of them as each is amazing! You can enter each giveaway or just those that interest you. 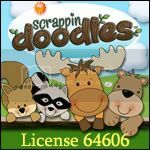 Because there are so many established bloggers donating, my hope is that it is easy to quickly go through the rafflecopter entries, since you probably follow a lot of their blogs and shops already. You may have to take time to follow some of the newer blogs and shops. But it’s worth it, and they’ll really appreciate seeing their numbers go up! The giveaway begins Sunday, July 15, and ends at midnight on Saturday, July 21 (technically Sunday, I suppose). I will announce the 6 winners on Sunday, July 22. Good luck! And thank you for following my blog! Great items in the giveaway. Pick me! Pick me! I love this great giveaway! Thanks for including me in it!! Congrats on 100 followers!! I always liked knowing words I shouldn't say in spanish! LOL, vamos a la playa-Let's go to the beach is appropriate enough for here I think! What a great giveaway! Lots of AWESOME items! Well I don't know many Spanish words but my choice would be "rojo". Thanks for this huge giveaway! My favorite Spanish words are por supuesto and guácala! I think they are really fun to say and I always interject them into every day English conversation! Zapatos! That's one of my favorite words! Congrtulations, and thanks for the great give away. Hands down; mi palabra favorita en espanol es sacapuntas. Es muy divertido decir esta palabra; no? Thanks for hosting this giveaway; I hope I win! Thanks for the opportunity to win such great stuff! My favorite Spanish word is sientate! I use the sign language sign to show sitting and say the word (my accent is terrible!) and my little firsties think it is hilarious. What a fabulous giveaway! Congrats on reaching your first bloggy milestone!! This is an amazing giveaway! Congrats on reaching 100 followers! Love this giveaway!!! I'm starting my own giveaway tonight. Hope you'll come by! right now my favorite spanish word is siesta because that is what my son is saying right now!!! tapete...we all head over to the rug! Thank you for having a wonderful blog site and for having this giveaway! My 1st language is Spanish so I like them all, but if I had to choose it would be "familia". My fav spanish word is manzana!! This was actually my first spoken word before english....thanks sesame street!! My favorite spanish phrase is "abre la puerta" I can't remember if this means close the door or open the door, but its fun to say! 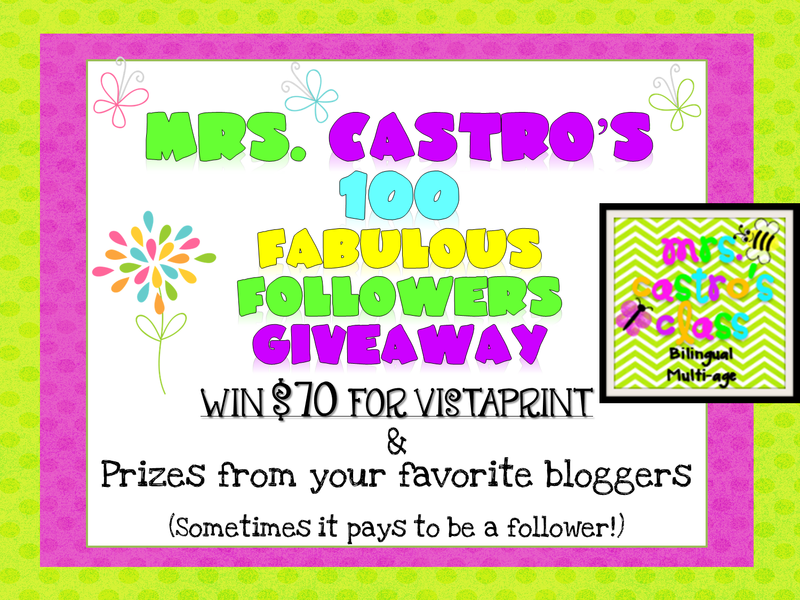 I would love to win the vistaprint giveaway. just found your blog, and LOVE IT. My favorite spanish word is "Senora" because my kids call our spanish teacher "Ms Senora Cannon" because they dont quite understand they dont need the Ms.. super cute. My favorite word is hola...probably because I know very little. As a former high school Spanish teacher turned elementary school librarian ... I will be back to check out more of your fun blog! Thanks for organizing this little "playtime." Great giveaway! I like bonita (pretty). In school, we had a sweet older secretary with the first name Bonita. All the students would call her 'bonita Bonita'! My favorite Spanish word would have to be "locura" because my husband always says I live in a state of "locura"! My favorite is te amo. I just started following your blog. What a great giveaway!!! Penguino! We have a song on CD that we love to dance to. My favorite Spanish word is gato. We also use the word gordo along with gato to describe my Tiger. My favorite Spanish word is cacahuates - it always makes me smile after saying it! Happy to have found your blog & be your newest follower. Check out my blog when you have a chance and enter to win my sunflower life cycle giveaway - wishing you the best WINNING luck! I love your blog! Thanks for sharing with us! I love listening to my son say the words he has learned on Dora. Great giveaway! My favorite spanish word is "loco". It is fun to say. What a super giveaway! Don't know too many Spanish words--I'll say amarillo. Thanks so much for having so many opportunities! I love it! Your going to have to have another one, your almost at 200!! My favorite spanish word?? so many my parents were both from Mexico:) Umm, I use sientate alot and flaquita for my daughters! Great giveaway! My favorite spanish word is "dinero"
Congrats!!! Your giveaways are great! I like the Spanish word Bonita. Loco is my favorite spanish word! WOW, you spent A LONG TIME getting this giveaway together! Way to go! My fav Spanish word is chicka! Congratulations on reaching 100!! Many more to join ! My favorite word is casa. I don't really know Spanish. I studied French. I like the word "amigos"...the waiter at one of our favorite restaurants says that to us when we arrive...we eat there a LOT! Thanks for the chance to win! Congrats and thanks for making it fun for us! My favorite word in hola! One of the only I know. Congratulations on reaching 100 followers! Thanks for the great giveaway! My favorite Spanish word is bueno. It always make my kinders smile when I respond to their work with a "bueno" or "muy bueno". My favorite spanish word is "bella" - beautiful! Thanks for doing this giveaway and happy 100+ followers! My favorite Spanish word is por favor. I like how it rolls off the tongue and sounds pretty and polite ! Mi palabra favorita es la verdad. My favorite word is Que? 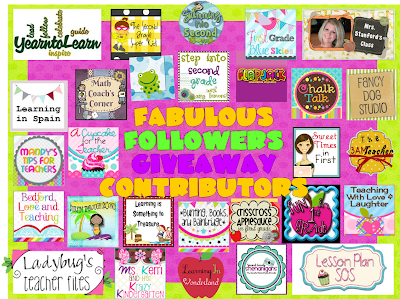 Holy moly giveaways!!! Thanks for hosting such an awesome set of giveaways!!! My favorite spanish word is cabeza. I remember way back when... in HS spanish class we learned the phrase "mi duele la cabeza" (sp?) I say it all the time!! I don't know many words...only what my daughter has learned from Dora! Haha! She says Abre (sp) for open instead of open and we say estrella (sp) for star all the time! Great Giveaway! Thanks! We are your newest followers! Thanks for hosting such an amazing giveaway! I think it is a beautiful language! One of my favorite words to say is "mas", my nephew's first word! Hi- Thanks for the opportunity. Hola! Thanks for visiting my blog! I am a bilingual elementary school teacher in Illinois. This will be my fifth year teaching. I've worked with primary and intermediate students, in bilingual and dual language programs. I'm married to a wonderful man who practices Spanglish as well as I do. I'm an avid reader and animal lover. Read more about me by clicking “about” on the top of the page. Basic Blog Design for Dummies! Place Value is "Snow" Much Fun! Baking... Crafting... & Teaching... Oh My!! Help! I don't understand how to use an APOSTROPHE! © Laura Castro 2012. Simple theme. Powered by Blogger.